FC Halifax Town's 2008-09 squad. After 97 years, Halifax Town had succumbed to insurmountable debts and gone into insolvency. It was left to the fans and a consortium of businessmen who had been financially supporting the old club to decide who would form the new club. Tom Scargill talks to those involved about how The Shaymen reformed and rose from the ashes over the turbulent summer of 2008 to begin their journey back up the leagues. Gavin Butler (front) and local suport groups at a meeting at the Shay. The dust was still settling on the demise of the old Halifax Town when Bosomworth, Stuart Peacock and Bobby Ham set about building the new one. Even before the old club folded, the future of any potential new club was already being considered. As early as April 2008, the club’s Supporters Trust had begun to explore a plan B, according to member and Town fan Gavin Butler. Jim Vince (left) and Nigel Jemson at the pre-season friendly against Bury in 2008. “A meeting of all interested parties was called in the South Stand Bar at the Shay on Sunday, May 11. “A representative of the consortium attended and explained they were still considering their options. “Certain members of the Trust felt that all the eggs should be put in the basket of the consortium, whilst others said a worst case scenario had to be prepared for. “This led to a split, with a number of Trust board members stepping down. The remaining committee continued to work on a plan B and liaised with Supporters Direct and various supporter owned clubs. Steve Payne in the pre-season game between Halifax Town and Bury at the Shay in 2008. 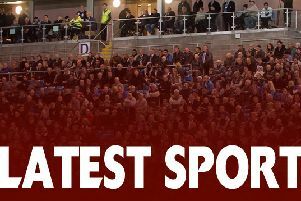 “Discussions were held with the West Riding County FA and the Football Association in gaining an understanding of what would be necessary to form a new club. Other meetings were held with Calderdale Council, the MP for Halifax plus other relevant agencies. “We lodged a ‘statement of intent’ with the FA advising them of the intention to form a new club. The plans of the consortium were still unclear. “We wrote to the 230-plus members asking whether we should withdraw our statement of intent allowing the consortium time to evaluate its own position. “The result was in support of the consortium, though due to the lack of understanding of their plans no withdrawal of our statement of intent was made. Stuart Peacock (left) and David Bosomworth before Town's pre-season friendly against Bury in 2008. If the demise of the old club had been a long, drawn-out affair, the construction of the new club was played out on fast-forward. The club was accepted into the Unibond League First Division North on June 30, and kicked off the campaign on Saturday, August 16 - only seven weeks later. Jim Vince, who had led Witton Albion to the Unibond Premier play offs in each of the previous two seasons, was appointed manager on July 2. The first training session took place on July 8 - less than six weeks before the campaign was scheduled to get underway. And 24 hours later, the new club, with no players, was installed as favourites to win the title and gain promotion at the first attempt. Neil Ross in action against Bamber Bridge. Then secretary Angie Firth says: “As David had been fully aware of the daily running of the club for some time he knew what needed doing. “There was never any doubt we would be ready for the new season, in a new league. “But it was all hands to the pump. We all pulled together, making phone calls and sending emails late in to the night to make sure all deadlines were met and we were ready. “The consortium had to provide a bond to the Northern Premier League, kit and many other items had to be paid for up-front, and written guarantees had to be provided, but we got there. “They could’ve walked away after the appeal, which they paid for, and didn’t, so all credit to them. “They made sure Halifax Town survived and with a stronger off-field business structure than had been in place for many years. “We said from the start ‘we will not have an overdraft’ and we never have,” says Bosomworth. “That meant it was really tight early on. Some money had to go in to get everything rolling before we got the gate revenue coming in. “You are nervous after what went on previously, you want to make sure that everything’s as good as it can be. When asked what the biggest challenge was in those early days, Angie Firth says: “I think trust. Suppliers and sponsors were dubious about working with the club again. “Some players had concerns about signing knowing of previous problems with payments. “I was excited,” says Bosomworth. “I’d had a grounding at Bradford and I’d seen what it took to run things at the old club. “We just wanted to get going with a clean sweep and be judged on what we produced. “When we came in, I said if we could leave the club at least in the same position it was in, debt-free, we’d be happy with that. That was a long way off where the rechristened FC Halifax Town would be starting life. “We were faced with a new club in a totally foreign league in terms of clubs, personnel and management,” says Bosomworth. “Halifax Town AFC had plied their trade in the Football Conference, and now we were three leagues lower in the Unibond North One. It was a fresh start for Halifax too. “Chris Wilder had called it quits, Adam Quinn moved for a nominal fee and Jon Shaw moved to Rochdale,” recalls Bosomworth, “but those funds didn’t come into the new club. “I don’t think those players came under the jurisdiction of Jim Vince. “But appointing a manager was the first priority because there’s only one person that’s going to bring players in, and we needed his experience of the league above. “We thought he would bring good players with him and give us a chance of a first-season promotion, which wasn’t to be. “When we played our first friendly at Tamworth, that was the first time that group of players had played together. “Even appointing a manager was very difficult, and history would suggest that we didn’t make the ideal appointment. “I’m not saying we should’ve won the league but we should have finished higher than eighth. One of the first signings under Vince and assistant manager Nigel Jemson was midfielder Neil Ross. “I’d been at Halifax before and I knew a lot of the people that had been there before it went bust,” he says. “So for me it was like going back to the same club, but just with a new manager and new players. “I didn’t think twice. They didn’t need to sell the club to me - it was a no-brainer. “There were only a handful of players there in pre-season at first, and we trained at quite a few different places. “But I knew the stability was there and the people running it knew what they were doing. “It wasn’t a case of me joining a club that wasn’t going anywhere or wouldn’t attract players. And Ross doesn’t just mean Trafford, Rossendale and Colwyn Bay. “I already had a good relationship with Jim from his time at Witton Albion,” says Jemson, “we both liked to play football the same way. “It was definitely something that excited me. He knew what he wanted to do and I was there to support him. Did Jemson think Town would win the league at a canter? “It was back to basics,” says then-defender Steve Payne on his arrival at the club. “The main stand wasn’t built yet and the changing rooms were over on the far side so it was all a bit run-down, but you could see the prospect of it becoming a big club again. It was a no-brainer for me. “We just had a plain blue kit for our first pre-season game, and I think we only got it the day before. And we only got the proper kit for the season the day before the first match too. “I joined halfway through pre-season. We trained at Spring Hall and at a local school with old astroturf which cut your knees if you fell on it. We just trained where we could. “I remember a pre-season game at Brighouse and I couldn’t believe how many Halifax fans were there. “Every away game was a home game, and every other club knew it. We regularly had two-thirds of the attendance away from home. The fans were fantastic. “There was a bit of expectation because we were Halifax, and I think everybody expected us to walk the league. “But perhaps there was a bit of arrogance from the players, thinking it was going to be easy, we can turn up and automatically win, but it didn’t work out that way. An amazing 1,549 supporters turned out for that opening game. “It was a great atmosphere,” recalls Bosomworth. “I felt so flat at the end, to go into your first game and lose 3-0 is not exactly the plan! “That was a sign of things to come that season. But it was a big moment, especially for all the fans that were there that day. “I think the fans responded incredibly well. They’d watched league football and yo-yo’d between the bottom division in the Football League and the top division in non-league, and then were told ‘your club is dropping three leagues’. “But they were glad to have a club to support again, whatever the why’s and wherefore’s. “My view is they got behind us incredibly well. I remember a friendly against Bury on a Tuesday night and we got 1,000 fans, so they did get behind it.